Race Day Hydration; Control what you can control! Watermelon season is still here! Besides being the official state vegetable of Oklahoma and related to the Cucumber & Pumpkin. 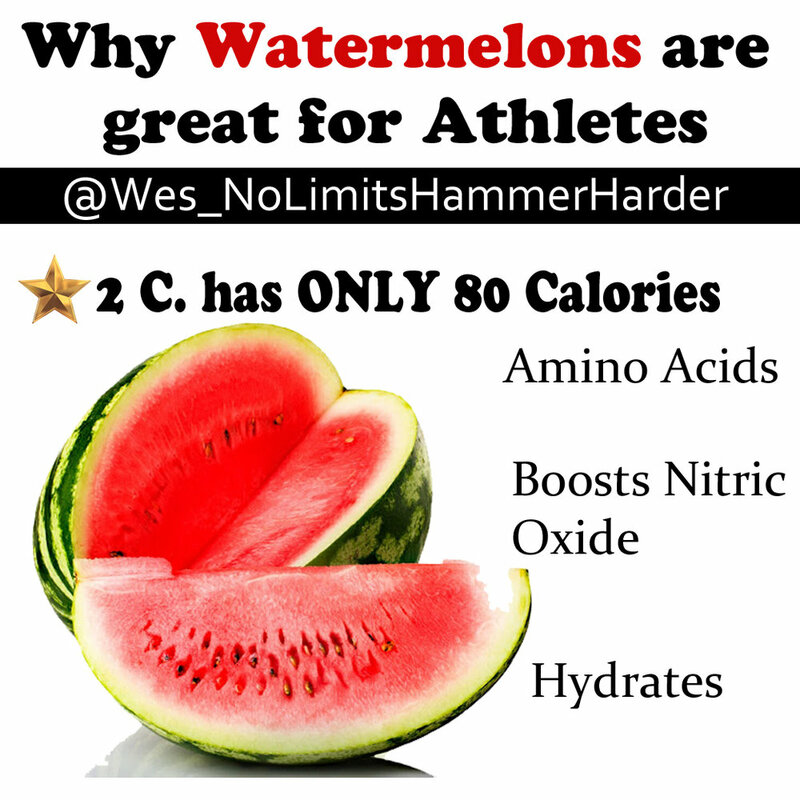 The watermelon has some great benefits for athletes. Great for hydration & fuel. It has a high water content, packed with electrolytes and is relatively high in natural sugars. In a 2015 study, it was determined watermelon may help athletic performance. Sprinting & Cycling in particular, due to the amino acid Citrulline. The amino acids Citrulline & Arginine found in watermelons also promote and increase circulation. Helping fend off muscle soreness. At only 80 calories per 2 cups it makes for a great treat, post workout snack or healthy desert. The amino acid benefits don't stop there. With them promoting Nitric Oxide which helps blood vessel dilation. Watch out Beets! Spitting seeds is also known to improve Run gait and over all leg strength. No it does not, I'm completely joking! But they do taste damn good‼️ And it would really cool if it did! September can still be hot & humid and we want to be dialed in and prepared for success on race-day. It is also important that we, as athletes, are prepared for high quality training days. I would also note, that the below tips are best implemented when they are practiced while training. In particular on those race simulation workouts. With out proper and adequate Nutrition(calories) and Hydration (not just water) your body will not function at its best ability and it may, under some circumstances fail you to a large degree. Both of these situations are in my "No Bueno" category. It is also important to note, if you are currently having 'success' with your current nutrition plan, you may have even 'more success' with a small tweak to your current game plan. Ex. You may be only consuming 10 oz of water on the bike per hour and be very fast & satisfied with your performance. I would suggest experimenting with the suggestions below. You may and probably will find you still have some "FREE" speed available simply due to kicking up your Nutrition Game. WHY? Great question. Ill keep the science to a minimum. Mostly because I am not a scientist. You sweat to keep your body cool so you do not over heat important things like the brain and your organs. Your body assumes over heating will lead to death. It does not understand you are running at tempo for fun, it merely recognizes danger in thermo-regulation and kicks in to survival mode. So it takes water to your skin via blood so you can perspire. The hotter you get, the more blood is needed to transport more water to cool you off. When you do not replenish the water, your body starts to run low on its current supply. It then gets desperate for water. Now here is where it really starts to affect your performance. It has 3 options to get blood/water. Organs, Muscles & your Stomach. Well, it is trying to protect your organs, so it does not go there. Instead it pulls from your stomach, ever notice when you are running and your stomach hurts or you eat a gel and your GI doesn't really agree with the food. It is because there is no blood in your stomach to digest it. Pulling blood from your muscles is also happening. Less blood in the muscles, means less performance your muscles can execute. Major fatigue then sets in due to loss of blood flow to the working muscles. This is why when you start to dehydrate your Heart Rate spikes. The heart is desperately trying to keep adequate blood flow to those muscles and continues to work harder and harder. Side Note: If and when your HR spikes unexpectedly or not in sync with your pace, dehydration has started to sink in. The reverse happens with lack of Calories or Glucose. You will not be able to get your HR up. Summary: A "bonk" is not always due to lack of Calories/Sugars. Dehydration is a huge contributor to poor performance. Pro Tip: Do not wait until you are thirsty. Abide by the above guidelines immediately during a race and TRAINING! Meaning, out of the gates, have a plan and execute it at mile one. It is significantly easier to prevent dehydration or bonks then to pull yourself out of one. *Those numbers are merely estimates, you may need to experiment with what works best for you. But, rest assured, they are darn close to accurate. You can use products like Ensure Plus to get extra calories prior to working out/racing. Infinit Nutrition sports drink has 300 calories per serving, and a great blend of electrolytes if you do not like to eat. In trying to keep this short, if you have any specific questions please feel free to email me directly! I am currently on a WAIT LIST but, if you are interested in my On line Coaching: Triathlon, Running, Cycling, Strength or Weight loss. Just shoot me an email and I will get back to you ASAP! APPLY FOR COACHING with WES HERE!!! Older PostLunge your way to Faster Bike & Run splits.